PHILADELPHIA — The Philadelphia Flyers turned to an outsider to try and win their first Stanley Cup in nearly 45 years. The Flyers hired Chuck Fletcher as their general manager on Monday in hopes that he can resuscitate a playoff team from a year ago that has become one of the worst teams in the NHL. He's the eighth GM in team history — and the first with no ties to the Flyers since Russ Farwell had the job from 1990 to 1994. "Our goal is to make the playoffs this year, it's that simple," Fletcher said. "We have work to do and it will be a challenge. But there's no reason why we can't get better and we can't push to make the playoffs and find a way to get in." 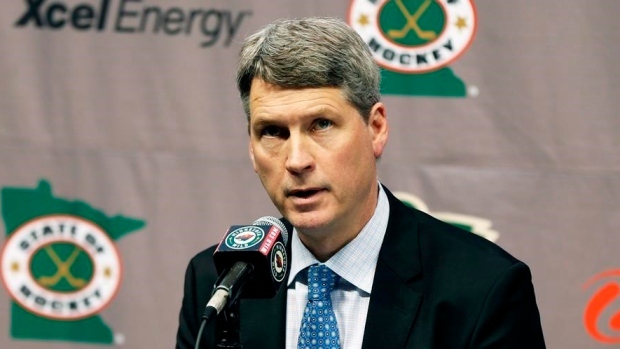 Fletcher, who replaces the fired Ron Hextall, had been working as a senior adviser to the New Jersey Devils after spending the last nine seasons as GM of the Minnesota Wild. The Wild had only two playoff series victories under Fletcher, a 25-year veteran of NHL management, and did not renew his contract in April. They went 15-29 in the playoffs during Fletcher's tenure, enough evidence that the roster wasn't built well enough despite all the success the team enjoyed in the regular season. That didn't dissuade Flyers President Paul Holmgren from pursuing the 51-year-old Fletcher a week after he cut ties with Hextall following 4 1/2 seasons. The Flyers are 11-12-2 and only the Devils are worse in the Eastern Conference. Holmgren fired Hextall citing "philosophical differences" and an "unyielding" approach toward sticking with his methodical rebuilding plan. Holmgren and parent company Comcast Spectacor want to win now and have squirmed as the Flyers have seen attendance dip while they drop in the standings and are losing a popularity contest to the 76ers, their fellow Wells Fargo Center tenant. "Chuck has earned success throughout his impressive NHL career and offers the right mix of expertise, business acumen and leadership qualities that the Flyers need today as we work to achieve our ultimate goal, the Stanley Cup Championship," Comcast Spectacor Chairman and CEO Dave Scott said in a statement. The Flyers also purged the organization of their longtime assistant general manager and an assistant coach considered close confidants of Hextall. Hextall had distanced himself from many key figures inside the organization and cut off alumni access to the team, factors that led to his dismissal. Fletcher, who also has the executive vice-president title, will have to do more than play nice with the old Broad Street Bullies to bring the Flyers their first championship since they won consecutive Stanley Cups in 1974-75. Holmgren said the new GM would decide the fate of coach Dave Hakstol, who is on the hot seat in his fourth season. Hakstol was hired by Hextall out of North Dakota and has led the Flyers to two first-round playoff exits. "I certainly have no intention of making a coaching change tomorrow," Fletcher said. "I'm going to meet with Dave and we're going to try to work together and push." Hakstol has tried to mesh a roster heavy with pricey veterans like Claude Giroux, Wayne Simmonds, Jake Voracek and James van Riemsdyk with potential blossoming stars in Ivan Provorov, Shayne Gostisbehere and Nolan Patrick. The Flyers desperately need a true No. 1 goalie; they've already matched a franchise record with five this season. "If we can't find the solutions internally, I certainly will look externally," Fletcher said. Will Fletcher want to trade prospects for veteran help or will he start breaking up a core — Simmonds is a free agent at the end of the season — that hasn't won a playoff series since 2012? He'll the needed flexibility to make moves, as the Flyers have roughly $7 million in available cap space. Fletcher, son of longtime NHL executive Cliff Fletcher, also has worked for the Pittsburgh Penguins, Anaheim Ducks and Florida Panthers. "He's a very cerebral guy. He's very good at building a playoff team, and he looks further ahead than just the year they're in and next year," Minnesota Wild owner Craig Leopold said. "He's going to be very successful. He was bold with us. We made some big moves. He's not afraid to make moves. I can tell you that. Bold he can do." With the Wild, he made a pair of bold moves when he signed Zach Parise and Ryan Suter to 13-year contracts in 2012. Holmgren, Hextall's predecessor, made a serious run at both players and now seems to have found a GM aligned with his hockey philosophies. "Throughout his career he has helped shape teams that have consistently competed in the playoffs," Holmgren said. "In addition, Chuck's tireless work ethic, wealth of knowledge and experience in the hockey community will be instrumental in leading our team into the future."